Flying Lessons: Air Methods, You Just Don't DO That. Air Methods, You Just Don't DO That. The Arabic word "haraam" is such an expressive word because it means two things; that something is forbidden and an activity is shocking. 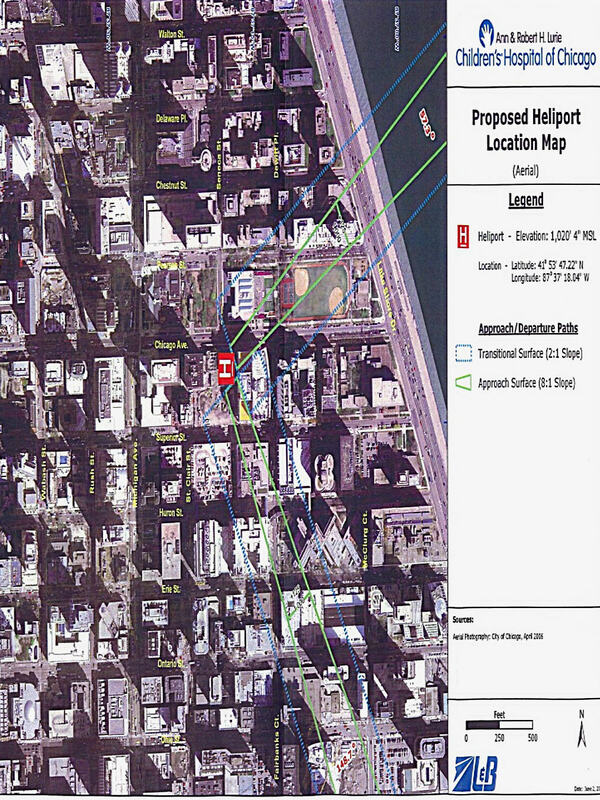 Haraam is the word that comes to my mind with the latest development in the plan to operate a helipad atop Children's Memorial Hospital located on Chicago's Lake Michigan. 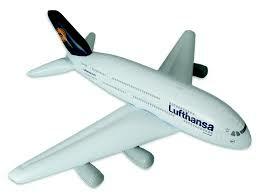 In the world of aviation, it is a article of faith that all employees must feel free to speak up about safety. So important is the concept that around the world, workers are encouraged to submit confidential or anonymous safety reports - even about their own mistakes - because with safety, you can't fix what you don't know is broken. Here is where the behemoth air ambulance company, Air Methods apparently took the fork in the road that separates those that wanna be safe from those that don't, according to a news report on ABC Channel 7 in Chicago. 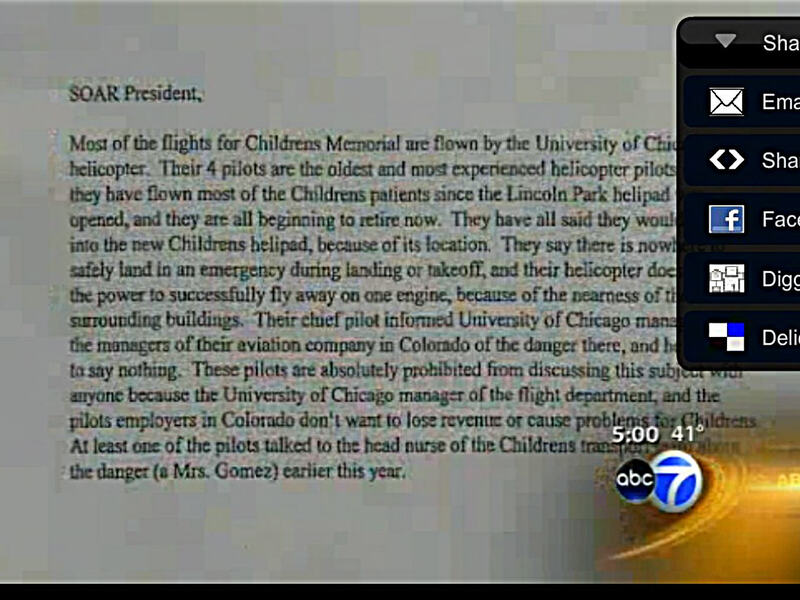 In the story, Ravi Baichwal, reports that an unsigned "whistle-blower" letter was sent to the neighborhood group opposing the helipad claiming that pilots who fly into the present ground-based landing zone for Children's Hospital in nearby Lincoln Park, have complained about operating risks at the high rise. But their concerns have been ignored. Further, they were prohibited from "discussing the subject with anyone" the letter says. 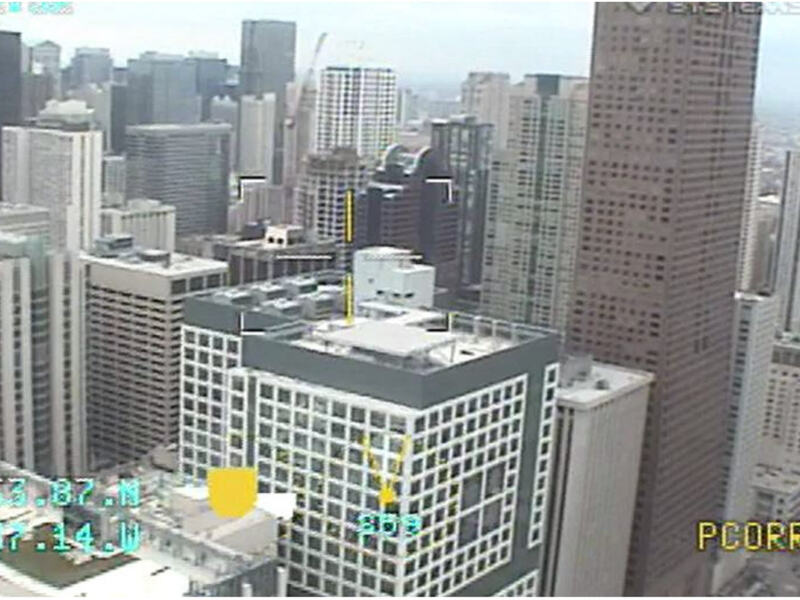 I have little doubt that back in the day when the hospital first conceived of the plan to bring helicopters onto their rooftop, 411 feet in the air, in a canyon of high rise buildings commercial and residential, that it had no idea it would be fighting with the neighbors for years. But fight they have as nearly every claim the hospital made about the benefits was challenged by nearby residents concerned about the risks. In a battle pitching expert against expert on subjects as dense as atmospheric boundary layers, vorticity isosurfaces and approach path trajectories, it's hard for the general public to know who is right and who is wrong. But when the very airmen who will be required to fly say the plan is bad, because there is "nowhere to safely land in an emergency" or that "their helicopter does not have the power to successfully fly away on one engine because of the nearness of surrounding buildings" that makes it pretty clear. So you can see why these people might be under pressure to keep quiet though to their credit, they have not. 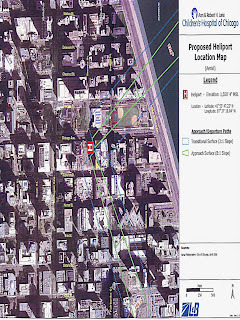 Instead, the unsigned letter was sent to Streeterville Organization of Active Residents, the neighbors opposing the helipad, a modern-day David fighting two Goliaths; a prestigious hospital and Air Methods Corporation, the nation's largest provider of air medical transport. The letter arrived just as the slingshot-armed-upstart was nearing the bottom of the bag of rocks. And now, the inspector general of the Department of Transportation has opened an investigation into whether either the Colorado-based and publicly traded Air Methods or the hospital tried to shush those who had something to say about safety. 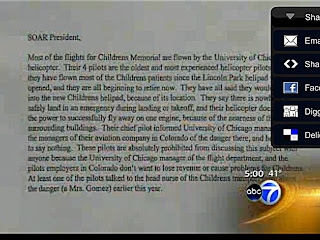 Of all the things helicopter ambulance companies and their enablers have done in the past decade to turn ostensibly life-saving medical transport into the for-profit multi-billion dollar, over-used and under-regulated sham that it is today, the decision to fight so hard for this location in Chicago seems uniquely arrogant and reckless. But if the inspector general finds that workers were indeed told to shut up about safety that's even worse, that would be haraam. A lot is done to improve safety by all concerned, regulators, operator and OEMs. These efforts are successful in that accident rates are on a downward trend while traffic is increasing. However, Safety is not only actions that are mandated by regulators. Safety is a culture, a way of doing things and eventually it should become a way of life. There lies the problem, people will find ways around regulations while deluding themselves that they meet the requirements. A risk assessment of hazards and mitigating actions should be made to reduce risk, all we seem to be doing these days is cost/benefit studies. When we are ready to do what is right, when faced with safety issues, and not cover up and intimidate people from voicing their concerns then and only then Safety would have become a CULTURE. It's ironic that air ambulance flying, designed to save lives, is one of aviation's biggest killers in percentage terms. Risk verses reward weighs into most things. You drive your car to and from work on your daily commute; it could very well be the last thing you ever do, but the reward makes it worth it so you take the risk day in and day out. If you don't like that, you move where you can ride your bicycle or walk; but you don't make others stop driving. Nor do you make your company move their location to where you can walk. I don't believe those "whistle blowers" speak for all helicopter pilots. The ability to land on pads such as the one in question is the very essence of what flying helicopters is all about. If those pilots don't like it, they should probably forget about their helicopter career and go fly airplanes. Don't throw the baby out with the bath water. Many helicopters are catagory A class 1. What airframe was AMC looking to place here? The Arabic language has two separate words, حرم ḥaram and حرام ḥarām, both derived from the same triliteral Semitic root Ḥ-R-M. Both of these words can mean "forbidden" and/or "sacred" in a general way, but each has also developed some specialized meanings. A third related word derived from the same root, حريم ḥarīm, most directly corresponds to English "harem". Ḥaram can also mean an Islamic holy site of very high sanctity. The two sites whose Islamic sanctity is unchallengeably the highest of all are Mecca and Medina in Arabia, so that the Arabic dual form الحرمان al-ḥaramān or الحرمين al-ḥaramayn refers to these two places. miss, mrs, or, ms ,Christine, Kudos' to u great, investigative reportin' just be very, very careful as u know it' a slipprey slope. marcus a.k.a. "RADIO "
The University of Chicago helicopter program, UCAN does most of the transports into Chicago childrens. They fly a 365N Daupin. Lordy.... if "their helicopter does not have the power to successfully fly away on one engine because of the nearness of surrounding buildings" - whose does?? When jets started flying they did not try to make a jet that could land on a 2000 foot grass strip, they made longer runways. You are missing the point completely. 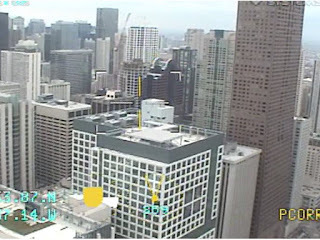 The helicopter is not the issue, its where the pad is located. Relocate the pad to a less confined area then this won't be an issue. Maybe you should go get yourself a helicopter with three engines since two isn't enough for you. While you are at it, make sure you get a tank to drive on the freeway instead of your car so you can make sure you will be safe. Or, just make DOT design highways that can provide a mile separation between vehicles and still process the same amount of traffic. Yeah, that ought to work. Then we can all be safe and won't even need HEMS anymore. It's great if we can disagree but keep the tone civil. Now, a point of clarification on HEMS transport. The majority of these flights are not from side-of-the-road accidents, they are inter-hospital transfers. It is a myth that muddies the debate that all these helicopters are engaged in edge-of-life missions. They are not. First, if the safety management system's hazard reporting system is being deliberately ignored or covered up in search of profit, that should be and I believe most courts would find it criminal. I find it hard to believe that the liability underwriters would cover unacceptable risk of any kind. Second, as previously noted, this is what helicopters are designed for. But, the correct tool for the task is essential. If this task requires Cat A capabilities, restrict it to Cat A ops. Profit overshadowing safety is one of the main drivers in the overly high accident rates in the HEMS industry. Let me repost my comment from another discussion today. This posting was addressing the lack of oversight of government run aircraft - the same applies here. I'm posting the comment verbatim so the reader can see the common nature of the problem. "When this lack of oversite was agreed upon, years ago, we did not have the wisdom derived from safety programs over the years since. Now, experienced safety professionals can understand that oversight provided by safety analysis is ideally relative to the operation. Therefore, today one should not hesitate to mandate or implement a safety management system. Managed properly, the system is incombent to the operation and should have the understandings necessary to conduct the required missions, regardless of their nature. To ignore the findings of such systems is to ignore possibilities of optimizing safety, effectiveness and efficiency. The only regulation needed would be one to institute a safety management system and to do so competently." There are some astonishingly arrogant and unhelpful comments regarding this issue. The main point, well thought out and presented, is that those with the highest level of awareness and the most to the lose, the pilots, are trying to raise an SMS issue may well being obstructed, by those whose first motive is profit, the executives. It is precisely that culture that is leading to a frightening level of fatal incidents in the EMS business. An accident of the type these insiders are anticipating would have a staggering effect on all of us in the industry. Not surprisingly those with the most disrespectful tone are similarly those most likely to hide behind the anonymous tag. An excellent article, a frightening response from the cowards gallery - possibly, from behind the desk of an EMS provider. Though possible, "an accident of the type these insiders are anticipating" is so statistically improbable it is very sad that anyone has given them an air of credibility. Also, Mrs. Negroni made a point of clarification in her Dec 5, 2011 12:29 PM post regarding scene flights and inter-hospital transfers. She is correct regarding most, if not all, Children's Hospitals HEMS services. However, there are still many HEMS providers that, in fact, do a fair number of scene calls in addition to inter-hospital transfers. That is another discussion in itself, in which I see Mrs. Negroni has participated. I respect most of Mrs. Negroni's work from what I have skimmed through since becoming aware of her blog. She considers herself a person who listens, and then writes. Sometimes it may serve, the public, her, and an issue better if she gives equal [listening] time to both sides rather than just jumping on the bandwagon of whoever garners her attention first. Landing at Children's new pad should be a walk in the park compared to some of the stuff in the video. No wonder AMC management thought it ridiculous to give the (helicopter?) pilots who complained any serious attention. As of 1 December 2012 Air Methods has no Safety Program Personnel at these bases, no base representatives. In effect being the largest EMS provider of helicopter services today, they can do about what they please. They are big business look at how their stock is doing.